As we prepare to hand our beloved Apache RR 310 back to TVS, we list its ups and downs and highlights over the past eleven months. The past year that we had with the TVS Apache RR 310 has been an interesting one. 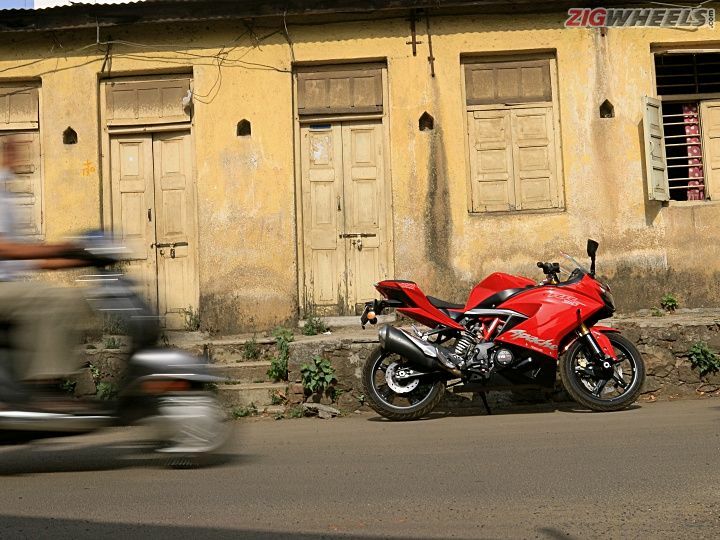 The first fully faired and 300cc bike from TVS had a lot of expectations riding on its muscular shoulders. After close to a year, the bike did deliver on those expectations on most counts, but missed out on a few. Here’s a roundup of the hits, misses and the memorable moments we had with the Apache RR 310 over the past year. TVS has nailed it with the design. The sharp lines and muscular bodywork makes it look quite similar to a Triumph Daytona. The size too is just right: it feels as large as a 600cc supersport, a big draw. Build quality too is quite good as is fit and finish. After eleven months of riding, the front fairing has started to buzz around the instrument console but that's about it. The bike was extremely reliable, with not one part coming loose or failing during our long stint with it. For starters, you have LED lighting all around. That's something you don't see even on bikes with twice its cubic capacity. The instrument console is feature-packed but I personally felt like it was overkill. It has close to 15 bits of information like four tripmeters, average speed, 0-60kmph time -- heck, even a lap timer. That's all good but the problem lies in the way you access the information. You have two buttons on either side of the console, one of which is used to turn on hazard indicators. So, effectively, you have only one button to navigate, to cycle through and reset data. And the button requires a lot of pressure to depress, leaving you with a sore thumb just after one cycle. In my eleven months of riding I did not use features like the lap time, overspeed, 0-60kmph even once. Maybe the next update could see a more intuitive and easier way to navigate through the instrument console. Oh, and also a more legible rev counter. Given my compromised vision requiring me to use eyeglasses, a bright headlamp has always been one of my major priorities while buying my bike. My 10-year-old Bajaj Pulsar 220F with its brilliant projector headlamp setup can attest to this. In that aspect, the Apache’s bi-LED headlamp with twin projectors does not disappoint. It provides a strong and wide beam spread and unlike other twin headlamp bikes, has both of its lights on in both high and low beam operations. These headlamps proved extremely helpful on my return trip from Goa, half of which was done after nightfall. The fantastic beam spread allowed me to comfortably ride at triple digit speeds in the dead of the night. Full marks to TVS on this. The RR 310 has a riding position that sits between sporty and commuter. Plus, the seat has a lot of space to move around. So you can easily cover long distances without taking a break, as I found out during an impromptu trip to my native place, some 200km from Pune. The comfortable seating and composed suspension meant the ride was done non-stop in around 3 and a half hours. This is a sportbike and as such, the design means it has a short and sharp tail section with no protruding grabrails. So it isn't exactly luggage-friendly. Same with the angular fuel tank which with a tank bag strapped on would make it difficult to properly lean on the bike and make for an awkward seating position. The saving grace, though, are the indentations on the pillion footpegs and rear number plate holder that allows you to hook on your saddlebags, or in my case a large tank bag. With my tank bag installed, riding space is at a premium and very cramped if you are wearing a backpack. The Apache RR 310 has one of the best suspension setups around, that achieves a good balance between ride and handling in a non-complex setup. The ride quality is fantastic. It feels pliant over broken roads and soaks up bumps without transferring judders to the rider or pillion irrespective of the speed. It handles quite well and given stickier tyres should be able to manage serious speed in corners. And the handling hardly changes even with a pillion or luggage on board as we found out while negotiating the fantastic twisties of Chorla ghat en route Goa. If there was one word to describe both the ride and handling characteristics, it would be ‘composed’. Don't get me wrong, the motor has good mid range and will get you up to 60kmph in double quick time. The problem lies in the way it behaves in mid to high revs. For starters, there are a lot of vibrations and resonance from the motor from 6000rpm onwards. And due to the gearing, these vibrations sit right at the cruising speed spectrum i.e. 80-100kmph. It makes riding the bike tiresome. You can get used to the vibrations (I did) but you are always left wanting for refinement and a bit more poke from the motor. To their credit, TVS has been constantly working on quelling the vibrations, the latest update being thicker handlebars and larger bar-end weights. Existing customers too received these updates from the dealership free of charge. It also could benefit from better fuelling at idling revs as you have to slip the clutch a bit to get going. I did realise that using premium fuel does smoothen fuelling at lower revs and makes the engine run a bit smoother as well. Baring the vibrations, it is a nice motor and I loved the fact that it never overheated even in sweltering Mumbai traffic or the coastal roads of Goa. This is one department that I have been disappointed with. Despite having radial calipers and sintered brake pads, the brakes lack initial bite and feel. They do have a strong bite but the ABS too cuts in too early and does not instil confidence. In contrast, the BMW G 310 twins had better brakes. Mind you, they run the same hardware with the exception of the petal rotors and a different ABS unit. This is something TVS should look into in their next update for the bike. The tyres too feel lacklustre. They get the job done but miss out on outright grip. I would strongly suggest stickier premium tyres like the Metzeler Sportec M5 or Pirelli Diablo Rosso III. They should allow for a more stable feeling around corners. While you're at it, you could also look at EBC sintered brake pads that offer better braking performance. How does it feel to live with a big bike? I use the term “big” as that's what fellow road users have in mind when they ask me about the bike. Most mistake it for a 600cc machine and to be honest, I have enjoyed every bit of attention received over the past nine months. And for all its sportiness, the fact that the Apache RR 310 is comfortable and has extremely capable suspension, was something that made my daily commutes so much easier. In fact, I look back at my Goa ride and feel that I should’ve done far more long distance rides on it. The bike certainly could have certainly allowed for it, even if my work schedule wouldn’t have. For a potential owner, this has to be one of the most affordable ways to get enjoy a part of the big bike experience. While spare parts are on the expensive side, unless you crash and don't have insurance in place, you’ll do fine. Reliability is on point and service cost is marginally more than a KTM so this won't break the bank. Would I go for one? I reckon I would but then I would also invest in better brakes and tyres to complete the package. How if I ask you to compare this with CBR 250R? Which according to you is a value for money product and more reliable ? How if I ask you to compare this with CBR 250R? Which according to you is a value for money product and more reliable ? @Harsha_NG No news about this but TVS has been proactively updating the bike and addressing niggles like vibrations on newer bikes. @Harsha_NG No news about this but TVS has been proactively updating the bike and addressing niggles like vibrations on newer bikes. @Nilabh_Sharma, thanks for pointing it out. It has been corrected. @Nilabh_Sharma, thanks for pointing it out. It has been corrected. Is a new model of rr310 coming this year? Is a new model of rr310 coming this year?